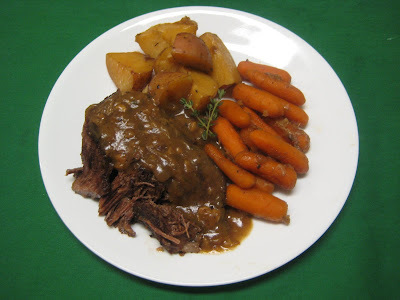 Nothing says 'Mom's home cooking' like a pot roast. It's the perfect comfort food! It satisfies the heartiest of appetites and it's an easy 'fix it and forget it' one-pot dinner. This is, without a doubt, the best pot roast you'll ever have. I'm not even kidding. It's seriously one of the most delicious things I've cooked in a LONG time. It's fall-apart tender, it's insanely flavorful, and I can't even tell you how good it smells while it's cooking all afternoon. It's just that good. Oh, and if you're new to cooking, this is the recipe for you. If you can cut an onion and open a can of beef broth, you can totally make this! Heat olive oil in a large Dutch Oven or a large heavy pot over medium-high heat. Sprinkle chuck roast with salt and pepper. Place the roast in the pot and cook it for 5 minutes on each side, so it becomes nice and brown. Remove roast from pot. Add onion; sauté 8 minutes or until tender. Add the red wine, thyme sprigs, chopped garlic, beef broth, Worcestershire sauce, and bay leaf to pot; bring to a simmer. Return browned roast to pot. Cover and place in oven. Bake for 1 1/2 hours. Add carrots and potatoes to pot. Baste vegetables with the beef juices. Cover again and bake an additional hour or until vegetables are tender. I like to remove the lid during the last half hour of cooking, just to brown the potatoes and carrots a little bit. Remove thyme sprigs and bay leaf from pan; discard. Shred meat with 2 forks. Make gravy with remaining juices or just serve roast with vegetables and pour a little of the juice over the top. Remove the meat and vegetables from the pot, leaving just the remaining beef juices. Make a slurry of flour and water then add to the juices and whisk until it thickens. I usually don't measure, but if I had to guess I'd say a tablespoon or two of flour to about a half cup water should do it. Oh, and btw, it's important to add the flour to COLD water before you add it to the pot. If you just add flour directly to the pot, it'll seize up into clumps, which is not very appealing at all. When you're browning the roast in the pot, don't fuss with it. Just place it in the pot and leave it there for 5 minutes. Then do the same thing on the other side. If you fuss with it and keep turning it, it won't brown properly. This works easily in a crock pot or slow cooker. Just brown the meat and saute the onions as directed, then throw everything into the crock pot and cook it on low for about 8 hours. Feel free to add other ingredients such as your favorite root vegetables or your favorite variety of mushrooms.